Special delivery: How will I receive my packages? It's 11:00pm, you're exhausted, but you remembered your mom's birthday is in 2 days and you haven't gotten her a gift yet. You jump online, and thanks to Amazon Prime, her gift will be here in 2 days or less. But wait, you'll be at work when the package comes. Who will be home to sign for it? Surely the delivery person wouldn't leave it just sitting vulnerable on the front steps until 5pm, would they? We've put together this list of tips and services that help answer one of our most frequently asked questions: What do I do with my packages? The easiest, most convenient way to handle packages is to rent in a concierge building. A concierge will be able to sign for mom's package, store it safely away, and notify you that it has arrived. Having a concierge is the ultimate in convenience, and one of the most sought after amenities. However, it does come at a price. After all, someone has to pay for the concierge's salary. These buildings tend to fetch higher rents for these amenities, but can't be beat in terms of convenience. What if my building doesn't have a concierge? 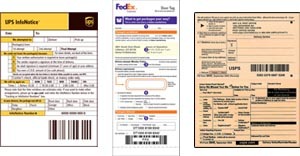 These are called door tags, and these are what the delivery companies will put on your door if you're not home to sign for a package that requires signature. The tags will have instructions on them as to your next steps, whether it be a 2nd attempt to deliver or an address where you can pick it up. However, if your package does not require signature it's entirely possible that they may just leave it on the front steps. This is what you do not want, so a quick solution maybe be to just have packages sent to your work instead if your work will allow it. Ok, so you don't live in a concierge building, you can't have packages sent to your work, and you don't want to risk having mom's gift left on the front steps. There are still options available to you to ensure that your packages are received securely. Think of them as a P.O. Box meets concierge. For a small fee these companies will sign and accept packages at their facility on your behalf, and then either notify you for pickup or deliver them to your door at a specified time after you get home from work to ensure that you'll be there to receive it. Have packages sent to your nearest UPS store and they will sign and hold them for you (from any carrier, too!). Have packages sent to their facility and they will sign and hold them for you. Let Doorman accept your packages and schedule an on demand delivery time within a specified 2hr window - a time that you choose and know you'll be home. So there you have it, all the different ways to handle mom's birthday present logistics. Whatever you got her I'm sure she'll love it, and have fun shopping online knowing you have options now!